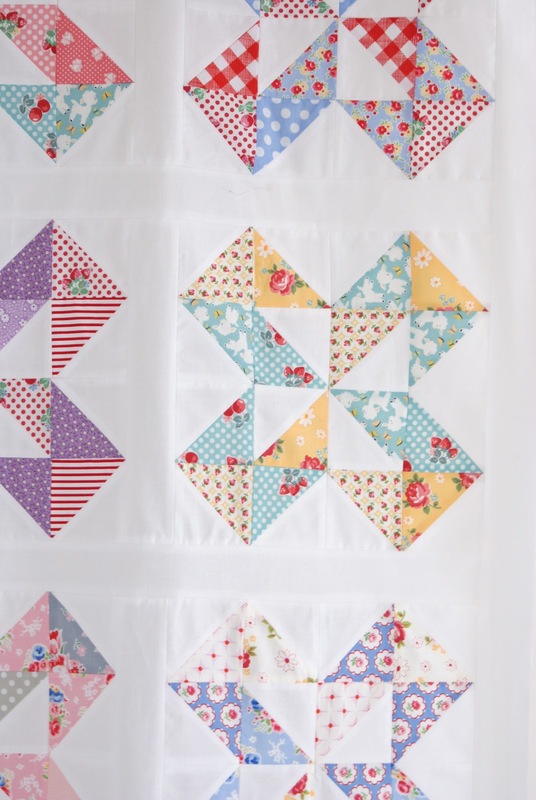 I'm really excited to share with you my 'finished' dutch pinwheel quilt top! I'm saying 'finished' because I'm still undecided if I'm going to add another border of some sorts? I'm really stuck, any thoughts on a border idea; simple squares peiced together? a printed border in one colour? Suggestions are greatly appreciated! It's wonderful. You did a great job. I see PKM fabric in there! If it were me, I'd choose a medium value fabric in whatever color you want to 'pop!" I'd keep it narrow--no wider than your sashing. These are just beautiful. Makes me want to add PKM to my stash! Wonderful! I would suggest a thin red border---maybe a red with tiny white polka dots. Oh this is SO pretty!! I love the pink and yellow one in the last photo! How about a border of alternating squares of white and some of the florals used in the blocks? This looks so fresh and beautiful, Jessie! What about a quite small border from one of the fabrics you used in the blocks (only half the width of the sashing) and then a wider white border? So pretty! I agree with what others have said...keep the border small and simple! This is beautiful. I agree with the simple look. Your focus is on those pretty blocks popping out from the white. Sometimes all you need is a colorful binding. It's going to look awesome! 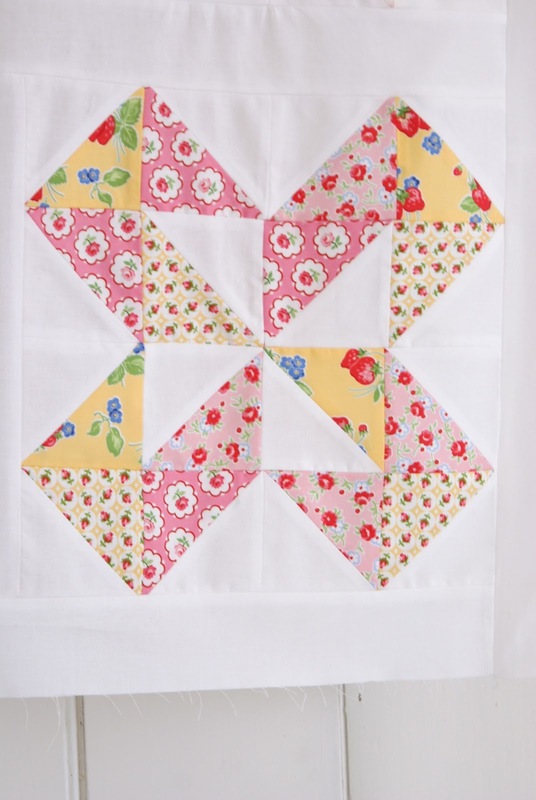 So pretty and I think a small border with the fabrics from the center would look great. It's great! I love how all the blocks look together. The colour white is perfect for your quilt. With a small colorful border it will be perfect. Congratulations! What a fun and beautiful pattern! HI! 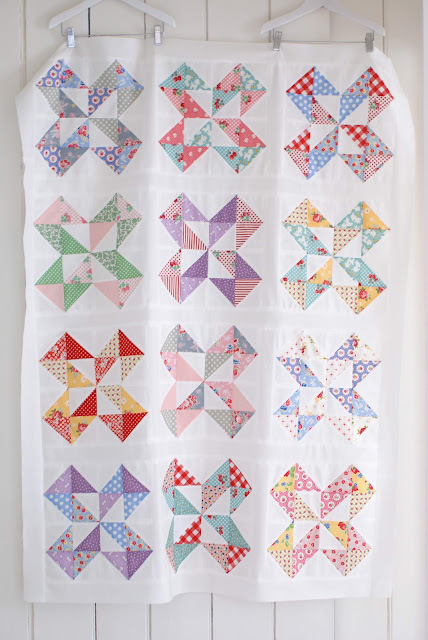 DO A POLKA DOT IN YOUR FAVORITE COLOR IN THE QUILT! HAPPY STITCHING! I love it...It's gorgeous just the way it is! I think it's just perfect without adding a border! sew pretty!! i adore it jessie!! I love this quilt! 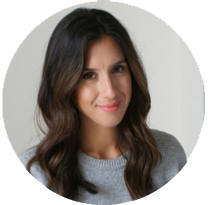 I hope you don't mind but I shared it on my blog today. Linked back here :)http://alwaysmakinglifeprettier.blogspot.ca/2013/02/big-girl-quilt-plans.html Thanks for the inspiration! Love this quilt pattern...can you tell me where I can find the pattern. I have some 30's fabric I think would be fab...thanks for your help! I have 12 of this pattern waiting to assemble together...so was so delighted to find yours! I had to "Pin" it. How did you finish it? ...it is beautiful!